Exuding endless amounts of Old World charm, Helvetia & Bristol is located in Florence’s historic center and in one of the city’s prettiest squares. Dating back to the late 19th century, the hotel has long held a luxurious, sophisticated ambience — it’s no wonder it has attracted a number of famous figures over the years, including famous writers and Nobel Prize winners Enrico Fermi, Gabriele D’Annunzio and Luigi Pirandello. These days it caters to in-the-know travelers who want comfortable, luxurious digs, a discreet staff and an excellent central location from which to see the city — cultural sites, celebrated restaurants and designer boutiques are within easy walking distance. • The cozy lobby lends itself to the feeling of your very own upscale living room, with a working fireplace, cotto floors covered with Persian rugs. 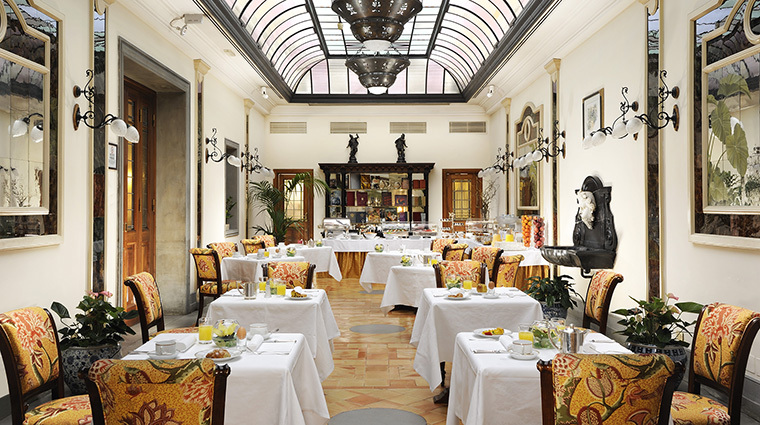 • The breakfast room is in a unique Belle Époque-era winter garden that was once a gathering point for the Florentine literary set. • Bar Bibendum is one of the classiest places in town and is an ideal place for a nightly aperitif. The space is enveloped in a warm color palette, wood paneling and refined Baroque furnishings; the cocktails are serious and painstakingly crafted by meticulous bartenders. • Helvetia & Bristol is undoubtedly one of the most enchanting places to stay in Florence: it is located in the heart of the historical center of the city – which has been named a UNESCO World Heritage Site – just a short walk from Palazzo Strozzi and the Duomo. • A few of the rooms have a bird’s-eye view of Brunelleschi’s Duomo — ask for a top-floor suite if you want to gaze at the architectural masterpiece from the comfort of your bedroom. • While views of Florence are lovely, you may also want to procure a room that doesn’t face the main street to avoid noise. 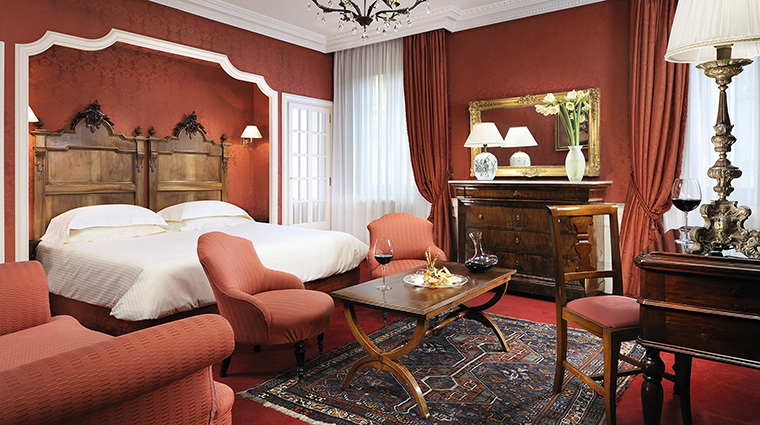 • No two guest rooms are the same, but the unifying factor is Old World elegance. • Brass lamps with Murano glass sit on top of 19th- and 20th-century furniture, collected over the years. • Rooms feature original paintings of Europe, antique prints and rich velvets and silks; some rooms have grand tapestries and brocaded wallpaper. • Bathrooms have smooth, colorful Carrara marble, some with whirlpool baths. The bath products are supplied by the exclusive brand Penhaligon, an English perfumer. • Try the Florence hotel’s beautiful restaurant, Hostaria Bibendum, under the direction of chef Luca Ciaffarafà. • It’s a popular gathering spot for locals who work in the area and those who appreciate the authentic Tuscan cuisine, including an impressive salad buffet with all sorts of seasonal and local fare, such as grilled zucchini, black olives, chickpeas and mozzarella cheese. • Dishes include classic tomato bread soup with basil sorbet, sea bream fillet with tomato cream and sweet pepper foam, and warm caramelized apple tart with spices. • The idyllic terrace outside is a superb spot to dine alfresco without the heavy traffic other central areas tend to get — be sure to toast your dinner companion with Italy’s answer to champagne, a glass of Franciacorta Cuvée Satèn.